Located in Paris (Paris City Centre), Hotel Jacques de Molay is within a 10-minute walk of Grands Boulevards and Picasso Museum. This hotel is 0.6 mi (1 km) from Les Halles and 0.6 mi (1 km) from Centre Pompidou. Make yourself at home in one of the 26 air-conditioned rooms featuring minibars and flat-screen televisions. Complimentary wireless Internet access keeps you connected, and satellite programming is available for your entertainment. Conveniences include safes and desks. My Hotel In France Le Marais is a smart 3-star hotel, which combines both traditionally Parisian and contemporary styles, found close to the Republique metro and the cool and exciting shops and bars of Le Marais. The hotel's bar and lounge area offers a relaxing evening retreat, while the reading room is a great place for a spot of quiet contemplation. All rooms have a flat-screen TV, complimentary wifi, a desk and a private bathroom. With a stay at Hôtel MARAIS HÔme, you'll be centrally located in Paris, steps from Grands Boulevards and 8 minutes by foot from Canal Saint-Martin. 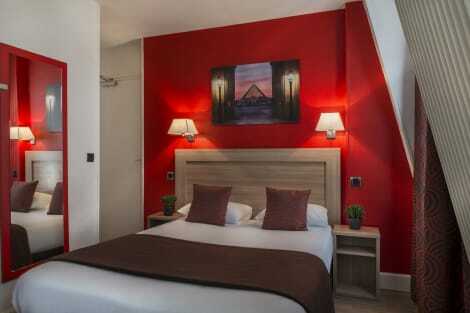 This spa hotel is 0.2 mi (0.3 km) from Place de la Republique and 0.5 mi (0.7 km) from Picasso Museum. Make yourself at home in one of the 31 air-conditioned guestrooms. Complimentary wireless Internet access keeps you connected, and satellite programming is available for your entertainment. Bathrooms have showers and hair dryers. Conveniences include phones and safes, and housekeeping is provided daily.